"a professional company who work with amateurs"
in creating theatre of a quality "that belies its amateur status" (The Perth Courier). Established in 1995, we have presented nearly 120 productions in a dozen venues across the region. In 1997, we were instrumental in the creation and development of Perth's Studio Theatre and were the Resident Production Company there until events in the fall of 2008 left us looking for a new home. While continuing to stage as many productions as we could in various venues, we acquired and renovated 26 Craig Street, aka Charlie's Carwash, a well-known Perth landmark, turning the circa-1947 building into our new home. The new theatre was created largely through volunteer labour. From initial drawings and plans to heavy construction work to final decorating, more than 50 people donated time, energy and materials to the facility. We also drew on re-used and re-cycled materials wherever possible. For instance, the panels of the stage front and proscenium arch used to be the panels of the car-wash's overhead doors and the seats are from Perth's 1915-1958 vaudeville theatre, the Balderson. We are now into our seventh season at the Full Circle Theatre, and are working to improve the facility at every opportunity. In our first year of operations at Full Circle Theatre, we hosted events ranging from live drama and comedy, music and dance to cinema and vaudeville to simple meetings. At our peak, we hosted 144 income-generating events in a season. The Full Circle Theatre is now widely recognized as the most comfortable, the most accessible and the most performer- and audience-friendly theatre in Perth. In November of 2012, David and Janice Jacklin were (individually) awarded the Queen Elizabeth II Diamond Jubilee Medal, "in recognition", as stated in the medal's citation, "of your contributions to Canada." Left: Our wide-screen, hi-def video projection system in place, showing moveable proscenium returns and placement of screen. "Had a great show in this lovely theatre with Kate Weekes last Saturday night. David and Janice are dedicated and professional. Their labour of love creating this space is much appreciated. Perth is blessed in many ways and this is certainly one of them. THANKS SO MUCH!!" And here's a link to a Youtube video of Kate Reid performing -- shot entirely at FCT! 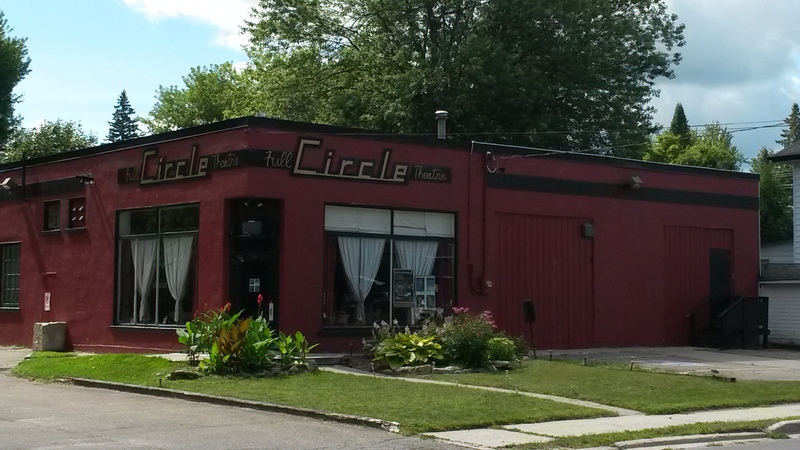 The Full Circle Theatre at 26 Craig Street, Perth, Ontario as seen in August of 2015. 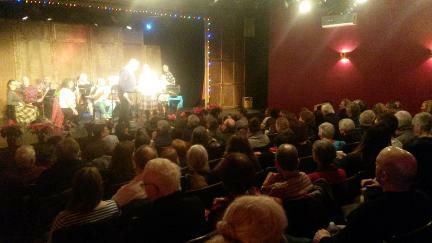 Below: The finale from our 2011 theatre opening gala, a video thank-you to all who helped us get there. 12-channel snake from stage to booth. Multi-effects audio processor in place. Our sound system is intended for use with live theatre and cinema events. It is not primarily for musical reinforcement. We cannot provide DI boxes, phantom power or MONITORING! The system is not set up for that. 20' X11' rear projection screen. Full time friendly proprietors with combined experience of over 70 years in theatre at every level, from scholastic to fully professional. Click on the graphic above for a saveable and printable plan of the FCT stage and house. 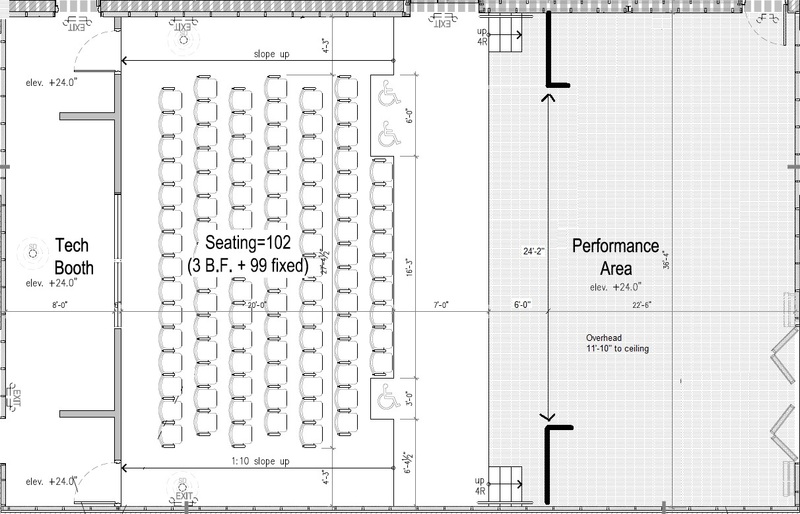 Stage dimensions indicated are from construction plans and may vary by a few inches. Above is a PDF version of the Full Circle Theatre Operations Manual, with details on building and technical systems.